The best route to the State Fair is on the bus! You go to the State Fair for the food, the animals, the rides and more! Getting to the "Great Minnesota Get-Together" on the bus is a fun, blue ribbon tradition, too. Instead of driving, park your car for free and take a stress-free, non-stop air-conditioned ride straight to the fairgrounds. Take a State Fair Express bus and you'll save on gas and parking costs. Plus, we'll drop you off and pick you up right outside the gates! Service begins at 9 a.m. on weekdays and 8 a.m. on weekends and Labor Day unless otherwise noted at all Metro Transit locations. Service from the State Fair operates until midnight. State Fair Express Bus tickets with the Metro Transit app! 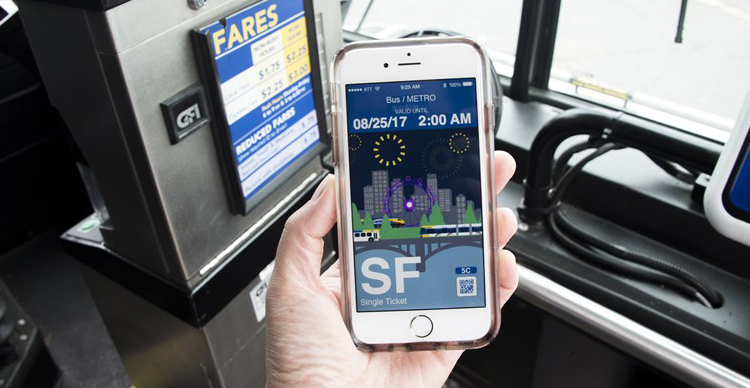 Save time AND money by purchasing your Bus Bargain ticket on the Metro Transit app. Only the Metro Transit app offers discount pricing prior to and during the Fair! App is available now on the App Store and Google Play. Buy your bus tickets online! Save yourself time when you buy your State Fair Express bus ticket online. Children four and under ride free! No more waiting for your bus ticket. After you buy your Bus Bargain Ticket, simply print it at home or send it directly to your mobile device. Learn more.